It might be just the fifth most-visited park in Alaska, but Kenai Fjords National Park is one of most beautiful spots in the whole state (and that’s saying something in a place like Alaska!). The park is 669,984 acres and more than half of it is covered in ice. There are almost 40 glaciers flowing from the Harding Icefield, one of the largest in the United States. Exit Glacier in particular is one of the park’s major attractions, and is a very visual example of climate change – the glacier receded approximately 187 feet from 2013 to 2014 alone. The park was designated as a national park in 1980 as part of the Alaska National Interest Lands Conservation Act. Kenai Fjords National Park is found in south central Alaska, on the Kenai Peninsula. 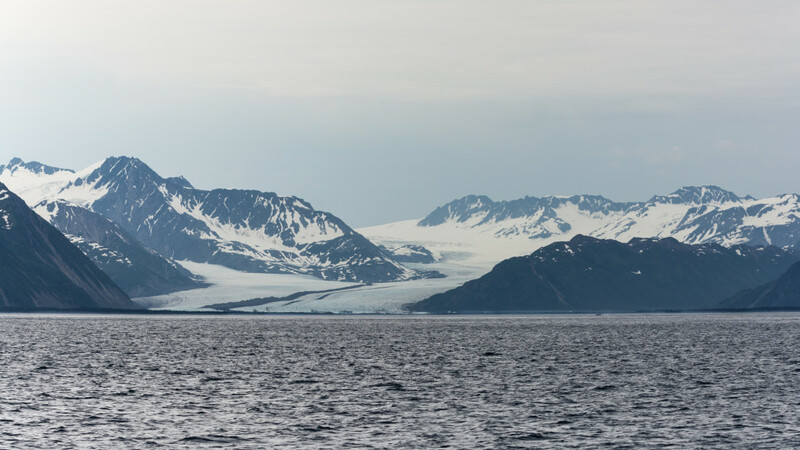 The fjords that have been carved by glaciers over thousands of years have created estuary ecosystems that are only found in five other locations in the world. There are around 20 species of seabirds that make their home in the park, including puffins, bald eagles, and peregrine falcons. There are about 27 species of land mammals and 10 species of marine mammals in the area, including moose, black bears, wolverines, coyotes, mountain goats, harbor seals, Stellar sea lions, porpoises, and sea otters. Whale watching cruises are a popular activity on the waters along the coast of the park. One of the best things about Kenai Fjords National Park is getting there. 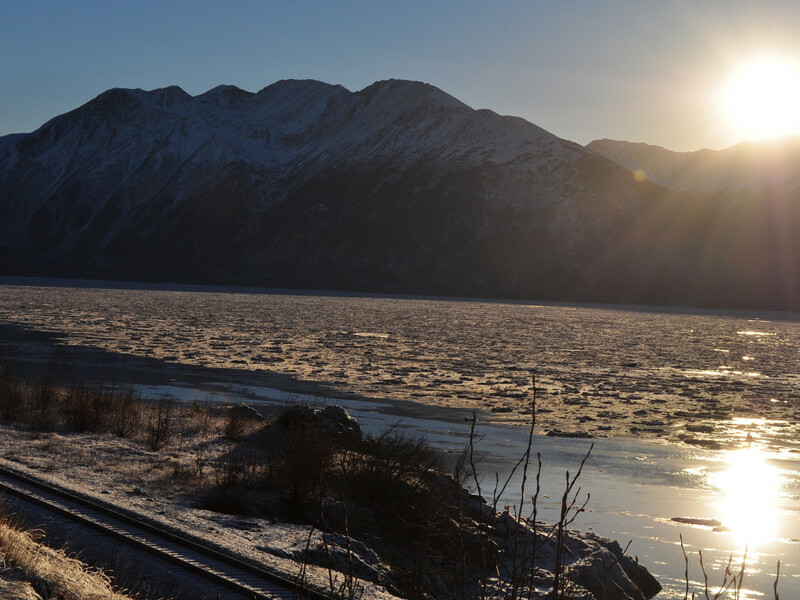 Visitors can drive to Seward, the nearest town, from Anchorage along the Seward Highway, a National Scenic Byway, or take the train from Anchorage. It’s possible to drive up to where Exit Glacier is; that’s the only part of the park accessible by car. The only way to explore the rest of Kenai Fjords is by boat and the Aialik Glacier is a popular destination. There are also opportunities for experienced kayakers to explore the fjords. Most people visit Kenai Fjords National Park to explore the Exit Glacier. Visitors can walk around the bottom of Exit Glacier and learn about climate change in the nature center. 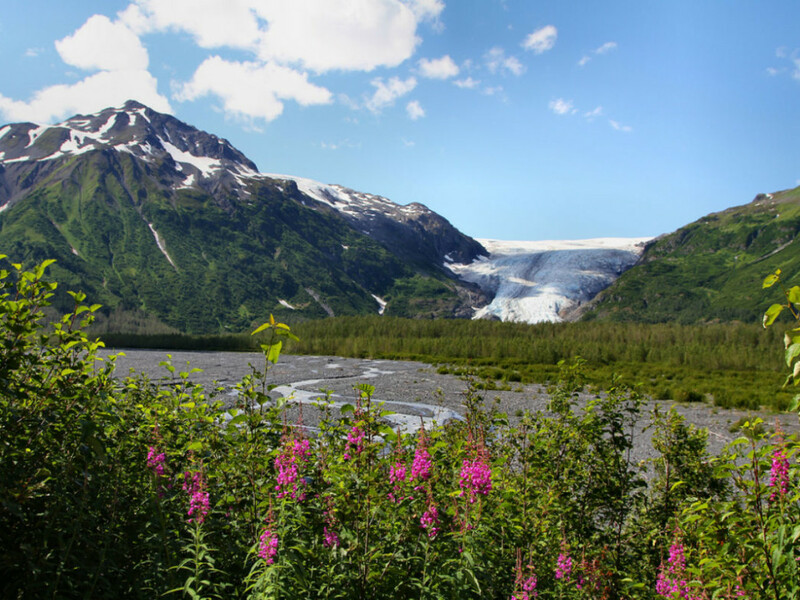 There are a couple short (but steep) trails that go up to a viewpoint of the Exit Glacier, or visitors can hike the 8.2-mile round trip Harding Icefield Trail. It’s a very strenuous day hike, gaining about 1,000 feet of elevation per mile, so plan on spending about 6-8 hours out there. The trail starts at the valley floor and winds through forests and meadows until getting above the tree line. Once at the top, visitors will have an impressive and breathtaking view of the entire icefield, which stretches as far as the eye can see. For those who might be nervous about taking on the adventure alone (bears are commonly spotted along the trail), there are ranger-led tours that leave the nature center at 9:00 a.m. on Saturdays in July and August. Mountaineers that have experience with traversing glaciers, crevasse rescue techniques, and are experienced skiers can ski or snowshoe across the icefield. April is the best time for this and the best access points to get on the glacier are on the east side and Tustemena or Chernof glaciers on the west. According to theNPS website, “the most popular routes are from Tustemena Glacier to Exit Glacier and from Chernof Glacier (via the Fox River on Kachemak Bay) to Exit Glacier. Exit Glacier is the ideal ‘exit’ since it is the one access point where you don’t have to rely on meeting a boat or a plane.” The trip can take anywhere from six days to a couple weeks, and mountaineers should be prepared for a storm to come in at anytime and cause white-out conditions. 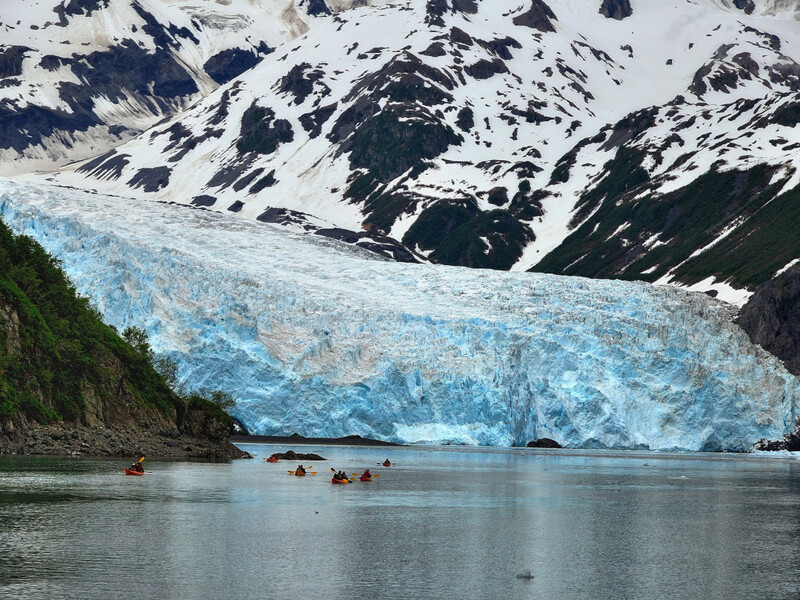 Kayaking is a challenge at Kenai Fjords National Park, but is really the best way to get up close to some of the wildlife and glaciers. There are guides available for more inexperienced paddlers and it’s not recommended that anyone, regardless of experience level, to round the Aialik Cape. The waters here are very dangerous. The best way to kayak in the park is to either get dropped of in Aialik Bay or the Northwestern Lagoon (there are campsites along the these areas to stay the night) or by paddling from Seward to Resurrection Bay, Caines Head, or Bear Glacier. Check the “Kayaking in Kenai Fjords” map to plan your trip. There are also some companies that take people on fly-in sport fishing trips along the coast. Resrurrection Bay and the fjords yield salmon, halibut, rockfish, and lingcod. There is freshwater fishing in the nearby Chugach National Forest. A state fishing license is required. The Aialik Bay is the most popular kayaking spot in Kenai Fjords National Park, so try the Northwestern Fjord instead if you are looking for more solitude. The water is that gorgeous blue-green created by glacial melt, and you can see the harbor seals and a variety of seabirds that spend time on the Northwestern Glacier. More inexperienced kayakers should hire a guide to navigate the tides. If you can drive to the park from Anchorage, the 127-mile Seward Highway is paradise for photographers. The scenery has beautiful mountains and lakes and the first 50 miles run along the Turnagain Arm, which is home to beluga whales. For a unique experience, book a stay in the eco-friendly Kenai Fjords Glacier Lodge. 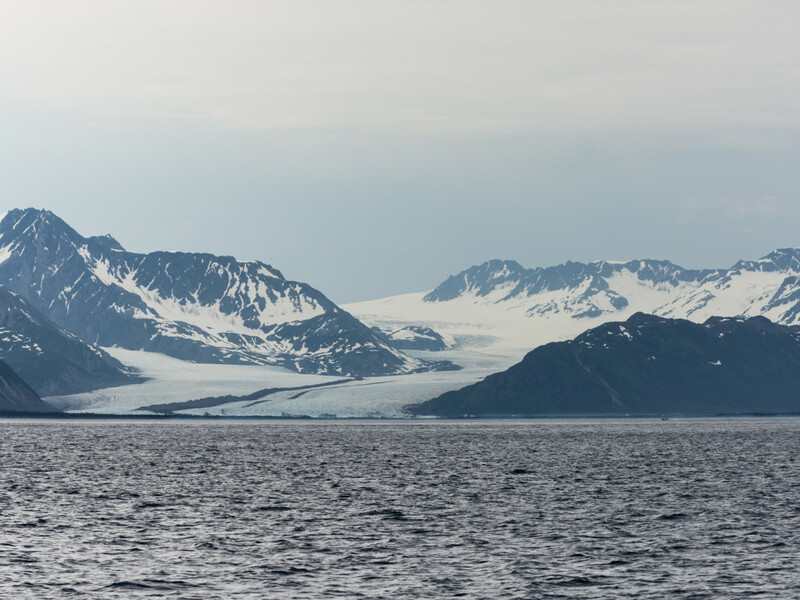 The lodge is surrounded by the national park and is only accessible via boat, which doubles as a marine wildlife and glacial cruise. Once at the lodge, there are nature trails to explore and kayaking in the gentle lagoon. There’s also a 12-person canoe that takes people across the glacial moraine to hike along the lagoon’s glacier. With the town of Seward as a home base, it’s easy to spend a couple days or more exploring Kenai Fjords National Park. Take your time exploring Exit Glacier, and then take a cruise or kayak tour around one of the bays. 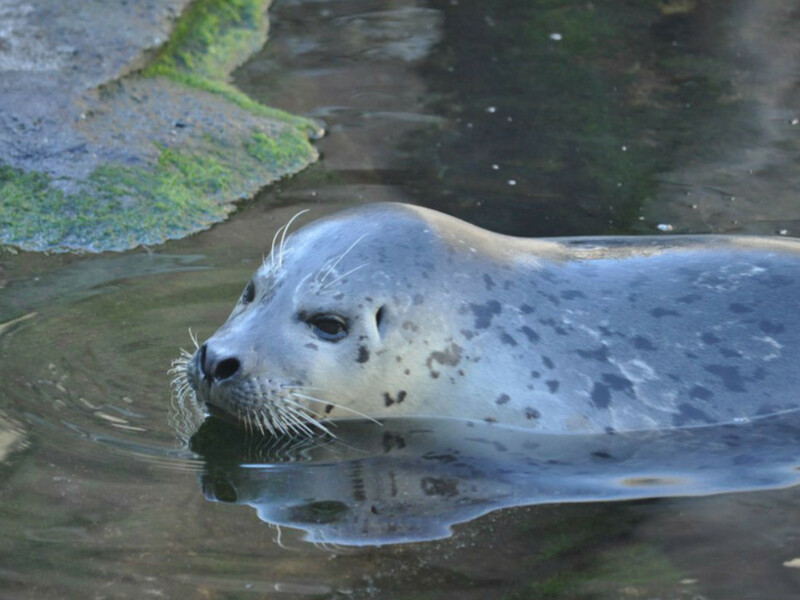 Seward is also home to the Alaska SeaLife Center , which is not just an aquarium, but also a marine mammal rehabilitation center on Resurrection Bay. It's a great place for kids, but also for adults to learn more about the animals in the area. Come prepared for any kind of weather, including snow on the trail. The trails are steep, so hiking poles are definitely helpful. The best time of year to visit Kenai Fjords National Park is the summer, when the days are longer. Summer temperatures range from 40-70 degrees Fahrenheit. The road to Exit Glacier usually opens around May and closes with the first snow (around October). You can still ski or snowmobile on the road in the winter to get into Exit Glacier. There are camping options that are accessible by kayak, or there is a 12-site, tent only campground just before the nature center.